As an Investor, why Attend? The SelectUSA Investment Summit is the highest-profile event dedicated to promoting foreign direct investment (FDI) in the U.S. It connects qualified foreign firms directly with U.S. economic development organizations to facilitate business investment and job creation. Each Investment Summit focuses on the U.S. investment environment, industry trends, and new opportunities. The SelectUSA Investment Summit is a time-saving mechanism for investors who are thinking about establishing or expanding operations in the United States. The United States is a land of diverse opportunities; our consumer market, our workers, our technology, and our resources are vast and varied. This diversity means there are opportunities for nearly every company from start-ups to medium-sized enterprises to multinationals. The SelectUSA Investment Summit provides unprecedented access to these opportunities all under one roof. The official agenda will feature the SelectUSA Investment Academy, plenary sessions, breakout sessions, and networking events. The 2019 SelectUSA Investment Summit will feature a variety of topics and speakers on the main stage and in breakout sessions over the course of two days. The main stage will showcase high-profile CEOs, senior executives, and U.S. government leaders, who set the tone for business and investment policies and trends in the United States. Breakout sessions will feature insights from state and local leaders, government officials, industry leaders, and other experts with knowledge into key investment trends. The SelectUSA Investment Academy is designed specifically for investors and economic development organization (EDO) representatives who want to make the most out of the Investment Summit. Participants gain valuable, first-hand insight into the U.S. investment environment through focused, thematic sessions in which expert practitioners from a variety of investment-related fields share practical tools, strategies, and actionable information. We encourage all SelectUSA Summit participants to extend their stay in the United States and travel to a variety of local communities to connect with economic developers, business leaders, and local experts while exploring promising investment opportunities in some of the most dynamic industries in the United States. The SelectUSA Investment Summit “State & Local Night” Reception and other private receptions offer ample opportunity to network. Any event held during the SelectUSA Summit in the Washington, D.C. area and hosted by an outside group with the support of SelectUSA is considered a SelectUSA Summit Collateral Event. Be part of the startup spotlight and start your entrepreneurial journey in the United States. Early-stage and startup tech companies from across the world will have the opportunity to pitch their products and designs over lunch on Monday June 10th in the Columbia Ballroom at the Washington Hilton. View the SelectUSA Tech Spotlight flyer for details. Registration is now open for the 2019 Summit. Demand to attend is high and space is limited. Those who wish to attend must submit an application. Qualified applications will be accepted based on the overall balance of attendees with respect to the source market and participant type. 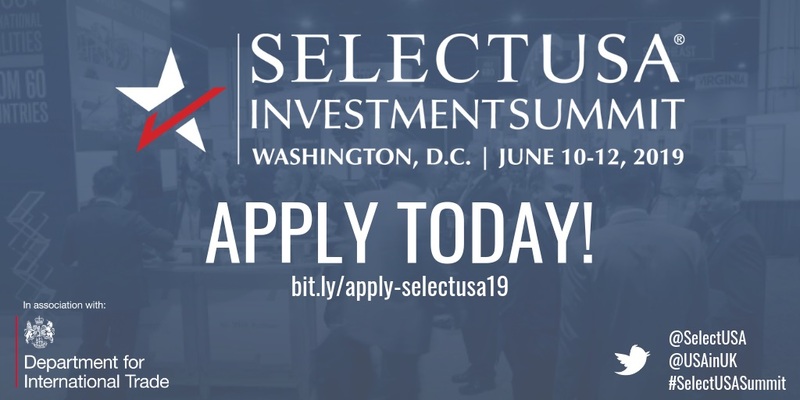 Sign up for updates and be among the first to know the latest information on the 2019 SelectUSA Investment Summit.